Property 8: Dreamy Treetop Loft in the Rice Fields! Property 15: Villa in Ubud. #3 Bedroom Private Pool. Stylish New Villa in Best Ubud, Bali Location! Property 16: Stylish New Villa in Best Ubud, Bali Location! Property 23: Private Suite with Amazing Bath Tub! 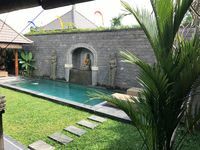 Property 32: Balinese villa in paddy fields nearby walking distance to Ubud center. Property 39: Private pool 8*18 m. Promo price! The villa was amazing and the staff was fantastic and helpful. A beautiful oasis away from the hustle and bustle of Ubud. We would recommend Alise Villa to anyone.